I have to confess, Wolf by Wolf, by Ryan Graudin, is my first alternate history novel. 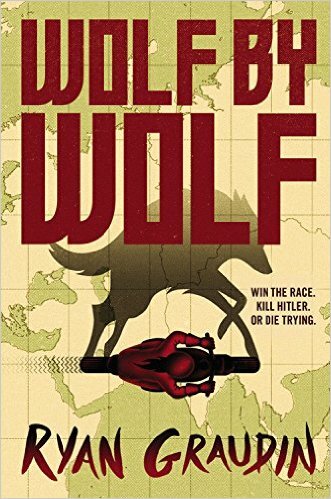 I’ve always been intrigued by the idea, but being plunged into a 1956 version of Europe in which the Axis powers won World War II was very unsettling, even if it was just in a book. The world has been divided into primarily German and Japanese territories, with a few Italian and African areas remaining. Yael, a concentration camp survivor, has been subjected to countless experiments. The result was something even the Nazi doctors didn’t expect. The changes they so coveted not only allowed Yael to escape, but they have become her means of revenge. Hitler, in his sixties now, is alive and well, and only a race away. If Yael can successfully impersonate last year’s victor and win the race again, she will have the opportunity to dance with Hitler himself. A knife hidden in her boot should do the trick. The only thing standing in Yael’s way is a race spanning thousands of miles across Europe and Africa on the back of a motorcycle, with dozens of highly trained competitors. Even if she can ride fast enough, will Yael be able to deceive the real victor’s brother? Or her fiercest competitor, who was the real victor’s love interest last year? If you are up for a fascinating alternate history/fantasy that will keep you on the edge of your seat, read on! Fair warning though. . .there are some German swear words, and Graudin doesn’t believe in the necessity of wrapping up loose ends. Thankfully, Iron to Iron, the sequel, came out March 8th! Mine too! Now I have to read the sequel! Very interesting! Thanks for the great critique, Erin! This is one I've never heard of and might want to check out.